Currency Converter: U.S. dollar - approx. 46.81Argentine peso - approx. 659Australian dollar - approx. 60.44Bahamian dollar - approx. 46.81Brazilian real - approx. 168.46CFA franc - approx. 27,120CFP franc - approx. 4,933Chilean peso - approx. 31,099Chinese renminbi - approx. 303.14Colombian peso - approx. 140,492Croatian kuna - approx. 310.51Czech Republic koruna - approx. 1,118Danish krone - approx. 307.64East Caribbean dollar - approx. 125.93European Euro - approx. 41.35Fiji dollar - approx. 96.62Ghanaian cedi - approx. 179.29Guatemalan quetzal - approx. 368.49Honduran lempira - approx. 1,054Hong Kong dollar - approx. 363.06Hungarian forint - approx. 12,871Icelandic krona - approx. 5,796Indian rupee - approx. 3,110Indonesian rupiah - approx. 618,454Israeli new shekel - approx. 176.80Jamaican dollar - approx. 5,713Japanese yen - approx. 5,097Malaysian ringgit - approx. 183.85Mexican peso - approx. 817Moroccan dirham - approx. 452.76Myanmar kyat - approx. 55,037Neth. Antilles guilder - approx. 83.33New Zealand dollar - approx. 67.40Norwegian krone - approx. 384.55Pakistan rupee - approx. 4,905Panamanian balboa - approx. 46.81Peruvian new sol - approx. 153.23Philippine peso - approx. 2,162Polish zloty - approx. 178.22Romanian new leu - approx. 185.10Russian ruble - approx. 3,102Serbian dinar - approx. 5,088Singapore dollar - approx. 63.32South African rand - approx. 678South Korean won - approx. 53,610Sri Lanka rupee - approx. 6,799Swedish krona - approx. 380.16Swiss franc - approx. 45.11Taiwanese new dollar - approx. 1,513Thai baht - approx. 1,639Trinidad and Tobago dollar - approx. 308.91Tunisian dinar - approx. 94.12Turkish lira - approx. 133.11U.A.E. dirham - approx. 171.94U.K. pound sterling - approx. 32.80Venezuelan bolivar fuerte - approx. 467.94Vietnamese dong - approx. 1,052,456 * Exchange rates shown above are estimates only, and may vary slightly from the rates charged by PayPal or your Credit Card Company. 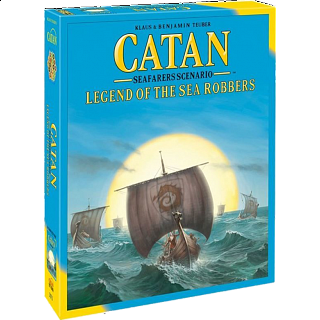 Catan Seafarers Scenario: Legend of the Sea Robbers is not a complete game and requires both the Catan base game and the Catan: Seafarers expansion. Seafarers Scenario: Legend of the Sea Robbers includes four new linked scenarios that tell the "Legend of the Sea Robber" to celebrate the 20th anniversary of Catan: Seafarers. Each scenario can be played individually, with players trying to win the game as usual by collecting ten victory points, but players can also record their scores at the end of each scenario, with effects of one game affecting the next. Relive the exciting Catanian Legend! 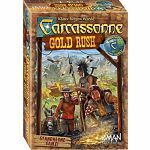 Become a clan leader whose adventures take place roughly 70 years after the arrival of the first settlers. They unfold over 4 chapters. In each chapter, the Council of Catan gives you special tasks. The Catanians have settled large regions of Catan and are starting to explore their surroundings by ship. You work for the benefit of your clan and open up new regions by building roads and settlements. At the same time, the Council requires you to be mindful of Catan's common good. Find the right balance between achieving your own goals and those of the Council and you might win the Legend of the Sea Robbers! Contains: 39 wooden figures, 55 game tokens, 4 sea robber island tokens, 13 friend cards, 16 sea robber cards, 10 trade option cards, 30 spice cards, 16 personel overview cards, 2 two-sided chapter overviews, 6 new frame pieces, 4 sea a terrain hexes, 2 gold field hexes, 4 spice island hexes, 8 building cost cards, 1 Special VP card, 1 Catan Chronicle and 4 ship tiles. People who purchased Catan Seafarers Scenario: Legend of the Sea Robbers also purchased the following puzzles.